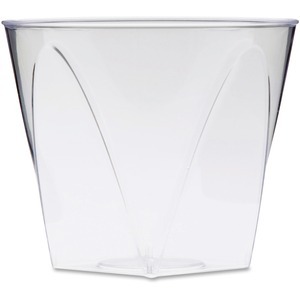 Tumbler features a unique design that provides the sleek shape of a square tumbler with a round upper rim for easy drinking. Versatile design reliably contains an assortment of beverages from juices and soda to beer and wine. Classy, polystyrene tumbler is perfect for upscale events, outdoor dining areas and more. Disposable design alleviates the inconveniences of permanent ware for hassle-free use. Recycle the No. 6 plastic tableware where facilities exist.